Definition at line 212 of file DiagnosticInfo.h. 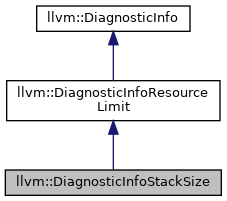 Definition at line 215 of file DiagnosticInfo.h. Definition at line 224 of file DiagnosticInfo.h. Definition at line 222 of file DiagnosticInfo.h. Definition at line 221 of file DiagnosticInfo.h.